Emily Wurramara performs Black Smoke, Hey Love and Ngerraberrakernama (Wake Up) at TEDxYouth@Sydney 2017. Emily’s debut EP is ‘Black Smoke’, 6 songs proving her passion for culture and heritage heard through every beat and skip of her deeply engaging and personal songs pulsed by her detailed and crafted talent for songwriting. Singing in both English and Anindilyakwa, the traditional language of her home on Groote Eylandt, NT, Wurramara says “The language songs are definitely a dedication to my grandmother.” Produced by acclaimed artist David Bridie (My Friend The Chocolate Cake: Not Drowning, Waving) and featured percussion by Greg Sheehan, released through Wantok Musik. Emily has become a seasoned performer who has taken her music around the country and abroad with show and festival appearances in Sweden and France. 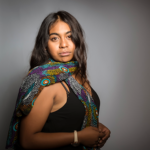 Closer to home she has performed at Gaarma Festival, Island Vibes, Woodford Folk Festival, Clancestry and numerous other events; performing alongside respected artists like Shellie Morris, Troy Cassar Daley and Impossible Odds. Add in a couple of 2016 Queensland Music Award nominations and the picture starts to build of a young artist with a very bright tomorrow.